Wendell Phillips Academy High School is a public school located in the Bronzeville neighborhood on the South Side of Chicago. Secretary of Education Betsy DeVos seems not to hear the fierce protests of parents, teachers and school officials over school closings and charter expansion in New York, Chicago, Oakland, Detroit and other American cities. How else to explain her continuing tone-deaf comments praising the glories of school choice? 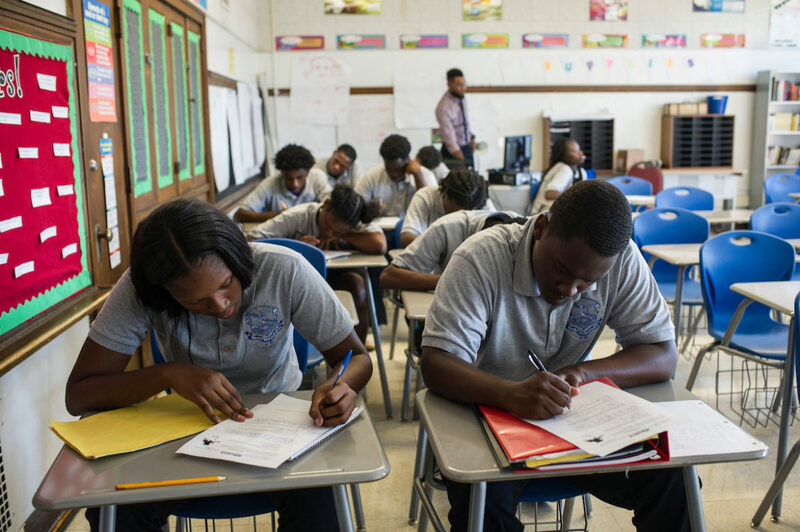 In truth, school choice does not exist in most black and brown communities in the United States. That is why her words ring false and her promises sound empty to the people living in those communities. Whatever hope existed that DeVos would learn on the job and inform her boss, President Donald Trump, of the need to respect that history and build on the effectiveness of American public schools while improving them, has been dashed. During her confirmation hearings, DeVos was criticized for her lack of experience with and knowledge of the public education system. What DeVos fails to understand is the intentional structural racism that has been accepted by Democrats and Republicans, where children from black and brown communities are intentionally underserved by the system all citizens pay taxes into. In Chicago, a child who goes to a neighborhood school near DePaul University enjoys a teacher’s aide in every class, robotics, debate teams, fully stocked libraries and after-school programs; while on the south side of the same city, in some schools there is one teacher’s aide in the building, with no library, no world language and 42 kindergarten students in one class. In the historic Bronzeville community on the South Side of Chicago, simply to save Walter H. Dyett High School, our community’s last open enrollment neighborhood high school, I joined 11 other parents on a hunger strike for 34 days, from Aug. 17 through Sept. 24, 2015. On the 25th day, Mayor Rahm Emanuel held a ribbon-cutting ceremony for a $21 million annex at Lincoln Elementary, a school with an upper-middle-class, white constituency in the upscale Lincoln Park community. Today, Walter H. Dyett is open, serving neighborhood children with $16 million in new investments and flourishing academically. DeVos has not yet learned that we, meaning black and brown families, don’t have the choice of great neighborhood schools within safe walking distance of our homes. In addition to the harm school closings inflict on student’s academic development and safety, only one out of five charter schools outperforms traditional public schools, despite the fact they can pick the children they want and discard the ones they don’t. Privatizers, such as the Great Lakes Education Project DeVos funded, play three-card monte with the public, utilizing political support, money and slick marketing to hide poor academic returns, increasing racial segregation and widespread corruption. A New York Times story detailed DeVos’ negative effect on schools and education policy in her home state of Michigan. This is what Donald Trump and Betsy DeVos want to spread throughout the country. According to the United Nations, America currently ranks 17th in the world in education. But when you remove the results of children living in poverty, we jump to No. 2. It is obvious we know how to educate children. We simply refuse to educate the poor, the black and the brown. As Betsy DeVos’ name was floated as the nominee for Education Secretary, my organization, the Journey for Justice Alliance, united with other networks around the country. More than a million phone calls were made to elected officials, thousands of letters, tweets and faxes were sent, and busloads of Betsy DeVos’ victims traveled from Detroit to Washington for the confirmation hearings. Congress was startled at the response, two Republicans switched their votes to “no,” and for the first time in U.S. history, a vice president had to break a 50-50 deadlock to confirm a Cabinet nominee. While Mike Pence’s predictable “yes” vote completed the confirmation, a new unity, a multi-racial resistance to “the illusion of school choice” rose in impact. At the Journey for Justice Alliance, as so-called reformers, we feel the same urgency to transform struggling schools. But we understand that imposing failed, top-down corporate education interventions on communities of color is merely the status quo, amplified. The #WeChoose Campaign demands what many children from middle-class white and upper-income families enjoy: a robust, rigorous and relevant curriculum, support for high quality teaching (smaller classes, teacher aides, effective professional development), wrap-around supports for every child (nurses, counselors, clubs, after-school programs), a student-centered school climate, transformative parent and community engagement and inclusive school leadership. The result: sustainable, community schools. As author Alice Walker said, “No one is your friend who demands your silence or denies your right to grow.” Betsy DeVos can’t seem to learn about the needs and desires of those she has pledged to serve. But that does not stop those who are working for equal educational opportunity for every child. Campaigns are underway in 35 cities across the United States, building grass-roots strength to resist the administration’s privatization policies and most importantly, advance the vision for equity in public education. On Tax Day this year, April 18, in several cities across the United States, students, parents and educators lifted their voices in a collective rejection of school privatization. The #WeChoose campaign will hold elected officials accountable over the next several months, advancing an equity-centered education platform, endorsed by millions of parents and students across the country. At www.j4jalliance.com, we choose equity, not the illusion of school choice. Jitu Brown is National Director of the Journey for Justice Alliance, based in Chicago, and a Public Voices Fellow of The OpEd Project. Excellent story with more than a little ring of sad truth. Follow the money. it would be interesting to know, for example, the total cost in taxpayers dollars to cover the salaries of the CEO’s of the various charter school systems across the city. My guess would be that we are paying many times the cost of the CEO of CPS who is charged with managing the truly public side of the system. There’s nothing “private sector” about the charter school system, it’s just a transfer of public dollars to private hands. Great article, Jitu!!!! NOW if WE can get these numerous, CPS schools , (about 25)to have their own stadiums, lighted, with 400 meter broken-back tracks, locker rooms, etc, 5-6 tennis courts, 50 meter pools and a diving well, and across the city CPS builds about 6-8 indoor 200 meter tracks for winter use, CPS will be heading in the right direction….To further cut CPS’s dropout rate, and cut teenage pregnancy even more, ALL CPS Schools with TITLE IX issues will have to be investigated….